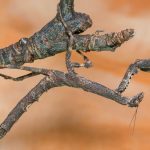 Popa spurca, also known as the African twig mantis, is a species of mantis native to Africa. It takes its common name from its resemblance to twigs and sticks and grows up to 8cm if female or 7cm long if male. These awesome masters of mimicry are an absolute joy to raise, and keep in the hobby. Relatively easy to keep, they are quite aggressive hunters, and will eat a wide range of prey items such as flies, hoppers, roaches, mealworms, morioworms, and moths.